Amazon Smart Plug works with Alexa to add voice control to any electrical socket. Schedule lights, coffee machines and appliances to turn on and off automatically, or control them remotely when you're away. Simple to set up and use: plug in, open the Alexa App and start using your voice. No smart home hub required: set up routines and schedules through the Alexa App. Choose from a catalog of 75+ compatible Alexa skills. Easy setup with an Echo, Echo Dot, Echo Show, Echo Plus, or Echo Spot. Just ask, "Alexa, setup my Echo Buttons". 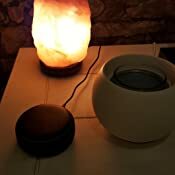 Connect up to 4 buttons with compatible Echo devices using Bluetooth. Each Echo Button requires 2 AAA batteries. Box contains 4 AAA batteries. Certified "Made for Amazon" accessory specially designed to work with the all-new Echo Dot (3rd gen.). Echo Dot sold separately. Adds a vibrant and fun colour to your Amazon Echo Dot. Comes in Candy Red, Bahama Blue, Hot Pink and Irish Green colours. Lightweight silicone case protects against accidental drops or scratches. 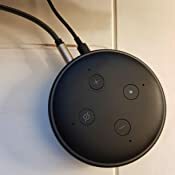 Not compatible with prior generations of Echo Dot (1st or 2nd gen.). Echo Connect uses your existing home phone service (analog landline or VoIP) to make and receive calls (operator charges may apply). 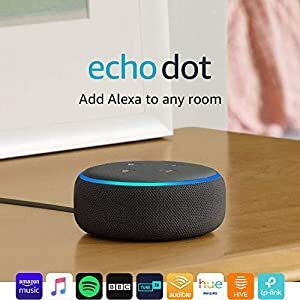 Simply plug Echo Connect into your home phone jack, complete setup with the Alexa App or on alexa.amazon.co.uk, and you're ready to make and receive calls. Easily sync all your contacts from a smartphone or tablet. Don't have an existing address book or mobile device? Use alexa.amazon.co.uk to quickly add the contacts you need from any Internet-connected PC or Mac. Connect your home phone to your compatible Alexa-enabled device and call contacts and voice-dial numbers from across the room and navigate automated phone systems with your voice. 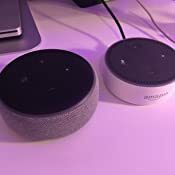 Echo Connect will work with your compatible Alexa-enabled devices. Only one Echo Connect needed per phone line. Explore more Alexa & Smart Home products. Amazon's Choice for "echo dot"
The Ring Alexa skill is now even better on Echo devices. Echo Dot can notify you when someone presses your Ring doorbell or when motion is detected. Use your voice to play a song, artist or genre through Amazon Music, Apple Music, Spotify, TuneIn and others. With compatible Echo devices in different rooms, you can fill your whole home with music. Also listen to Audible and radio stations, or pair with Fire TV to voice-control films and entertainment. Switch on the lamp before getting out of bed or dim the lights from the sofa to watch a film—all without lifting a finger. Control multiple devices with a single voice command, like locking the doors and turning off the lights at night. Learn more about hundreds of compatible smart home devices, including lights, thermostats, TVs, and more. Call anyone with an Echo device, the Alexa App or Skype hands-free using your voice. Plus, now with Skype calling stay in touch with loved ones in over 150 countries - learn more. Alexa has tens of thousands of skills and counting. Skills are like apps and help you do more, such as playing True or False, tracking your fitness with Fitbit or falling asleep to rain sounds. Create your own personal skills and custom responses with Alexa Skill Blueprints. Just say “Alexa, help me get started with skills”. New skills are being added all the time. Discover skills in the Skills section of the Alexa App or visit the Skills Store. Echo Dot comes ready to connect to your Wi-Fi. The Alexa App is compatible with Fire OS, Android and iOS devices, and also accessible via your web browser. Certain skills and services may require subscription or other fees. 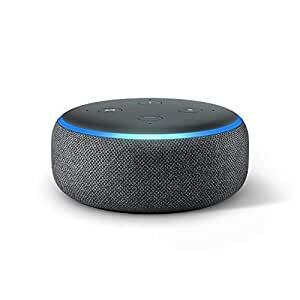 Amazon Echo Dot (3rd Generation) is sold with a limited warranty of one year provided by the manufacturer. If you are a consumer, the limited warranty is in addition to your consumer rights, and does not jeopardise these rights in any way. This means you may still have additional rights at law even after the limited warranty has expired (for further information on your consumer rights, click here). Use of Amazon Echo Dot is subject to the terms found here. 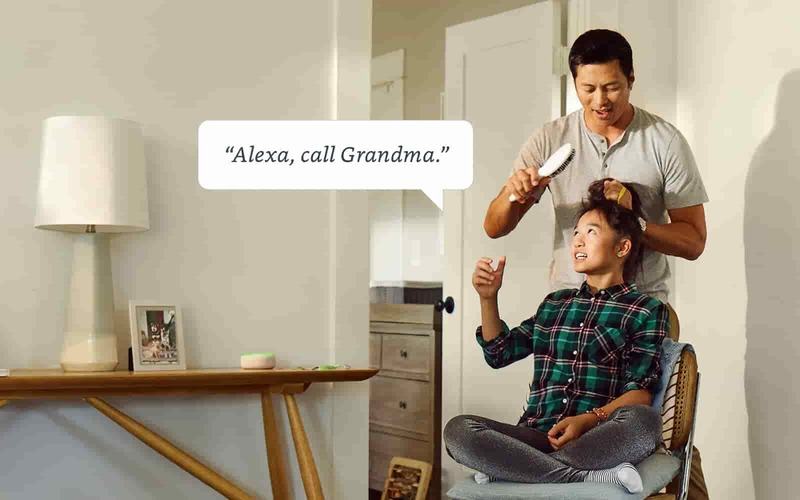 The Alexa App and Alexa-enabled products include several features for customers with accessibility needs related to vision, hearing, mobility and speech. Learn more about Alexa accessibility. 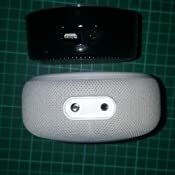 Echo Dot, power adaptor (15W) and Quick Start Guide.